I’ve been looking forward to Marvel’s adaptation of their Thor character for a while now, ever since it was announced that Kenneth Branagh would be directing. I thought right off the bat that Marvel had made a wise choice, and I’m happy to see that choice was justified. I had a shaky moment or two when I actually saw the first images and trailers from the film, as to say that they looked like something a film student would do would be an insult to film students everywhere. But now I’ve seen it. And it is wonderful. Here’s the saga: Thor is the son of Odin. They are both part of an ancient race of extra-dimensional creatures that were once worshipped as gods (though Branagh goes out of his way to ensure that the “g” word is barely mentioned here, in deference to our hillbilly cousins to the south) on Earth. Thor is the greatest warrior of his race. He’s also a bit of a douche. And so his father strips him of his powers, and banishes him to Earth. Once there he is found, and flirted with, by Natalie Portman. Eyelashes are batted. Adventures ensue. The script: It’s also a tight script, and it’s one that makes Thor that rare superhero movie that has a better origin for its lead character than the actual comics ever did. The script is a combination of Stan Lee and Jack Kirby’s original Journey Into Mystery stories, J. Michael Strazynski’s recent run on Thor, and Mark Millar’s work on the character in Marvel’s Ultimates line, and to my mind should pretty much be the definitive origin for the character going forward. In addition, the dialogue really set the tone here, and walks a fine balance between simple fun, and straight camp. The script also understands that it’s not necessarily Thor and the Asgardians that people want to see, it’s Thor and the Asgardians interacting with people from Earth. It’s your classic Stranger In A Strange Land scenario. That’s what’s always worked best in the comics, and it’s a big part of why this works as well as it does. The acting: Chris Hemsworth is a star. You might not know it yet, but he sure as hell sure does. His portrayal of Thor has all of the intensity you would expect from a great warrior, but also has a sincere humility and charm that basically makes the film. Like Robert Downey in Iron Man, it’s Hemsworth’s performance here that is going to be what allows non-superhero fans to truly enjoy this movie. Fantastic choice, and I for one can’t wait to see how he interacts with Downey and Chris Evans in The Avengers next year. Not that this is a one person cast. While I still think the role of Jane Foster was wasted on someone as talented as Natalie Portman, she still did a fine job here. And Anthony Hopkin’s Odin really captured the idea of an old and tired god, who wants nothing more than to hand the reigns of power to his son. But it’s Tom Hiddleston’s portrayal of Thor’s kind of evil but not really evil but still pretty evil brother Loki that is the other real star of this show. He mixes the perfect blend of mischievousness and anarchy for the character, and I think Marvel is right to feature him as the lead villain in the Avengers next year. The direction: Branagh was the perfect choice for this, as he’s a director that not only understands father-son drama VERY well, but also understands how important character is to whatever story you’re telling. This entire movie is crafted around character. It’s character that moves every plot point forward, and even minor characters are full realized under Branagh’s direction. Almost everything else: This movie really captures the wonder of Asgard. This is a true land of the gods. This is also Marvel raising the bar. This is still only done 3 movies now on their own, but it’s the first one that really moves out of the mostly light sci-fi world they’re been playing in, and pushes into full genre storytelling. And it’s effortless. Like the original 1960s Marvel Universe, you truly believe that the same world that has gamma monsters and futuristic battle suits would also have travellers from another dimension. I’m not sure if it was the fact that Branagh has never really done this type of movie before, or Marvel’s legendary frugality, but the CG isn’t exactly going to light anybody on fire. I’ve seen a lot worse, but rarely in a movie this good. Although this is a story and character-driven film, it’s also one with a LOT of CG, and so the poor effects are quite noticeable. The problem with movies like Avatar setting the special effects bar as high as they do, is that if you hope to hit that bar, you need to spend $300 million. Marvel did not, and so the effects aren’t great. That is a SMALL price to pay, and is a relatively tiny gripe. 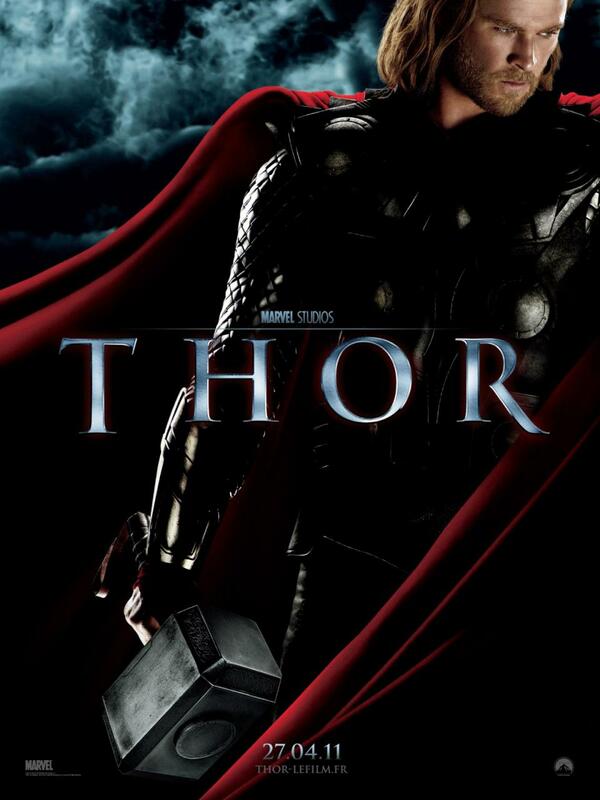 In short, Thor is the perfect superhero movie. It captures a healthy mix of camp, adventure, and action. And it’s fun. So much fun in fact, that I will pay it the highest compliment I can: I want a sequel. This entry was posted in Comic Books, Movies and tagged Avengers, Chris Hemsworth, Iron Man, Jack Kirby, Marvel, Movies, Stan Lee, Thor. Bookmark the permalink.